During the week-end, I have always a bit more time than usuall and I enjoy to use it to cook. So yesterday afternoon I prepared a Rosmarin potatoes gratin to be served with a rack of lamb marinated with garlic and rosmarin. I cooked the following recipe for approximately two persons. 2. Oil a plate, peal and slice the potatoes and wash them to remove the amidon. 3. Peel and press the garlic. Don’t forget to remove the green sprout. 4. 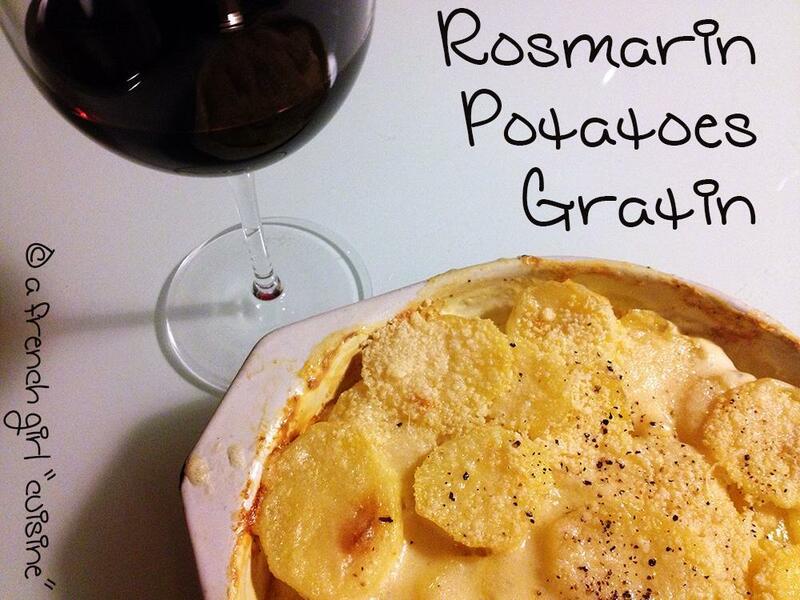 Mix in a bol the cream, garlic, salt, pepper, fresh rosmarin and a little bit of white wine. 5. Place half of the potato slices in the plate and pour half of the mix with the cream. The potatoes need to be cover up of liquid. If it is not the case, you can add a bit of water. Place the potato slices left and the rest of the cream. Let’s back during 50 minutes.